Dayton 2015 – Part 2 of ? This year I stayed in downtown Dayton, at the Dayton Marriott. It was my first experience driving in downtown Dayton as last year I stayed at a hotel close to Hara north of town. Dayton has obviously seen better days, and folks walking the streets living in poverty is a common sight. 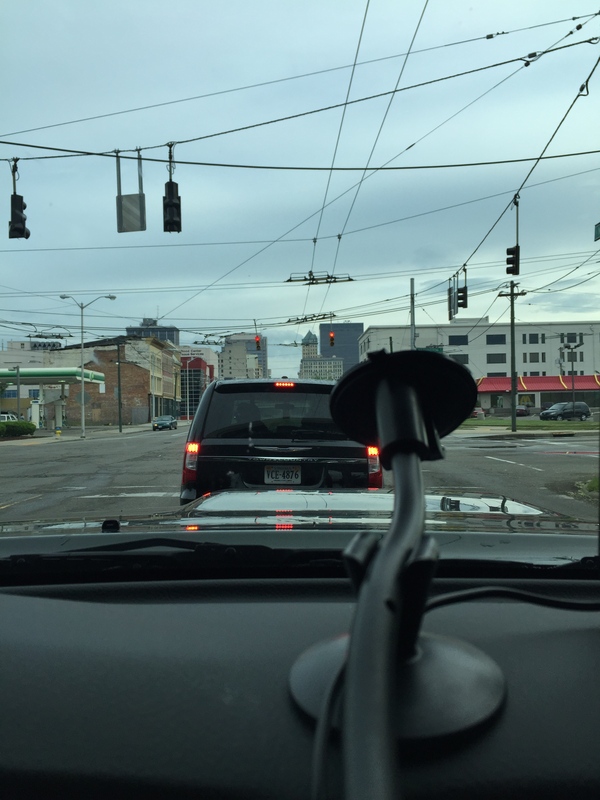 Driving through downtown Friday morning I wondered what the locals thought of all the vehicles with antennas driving by for one weekend out of the year. Do they know anything about amateur radio? The word Dayton to us means amateur radio Mecca, but to them Dayton is just the place they live day in and day out, trying to eek out a living. They were likely born here, will die here, and probably will not get to see much of the world outside of Dayton. I think back to my childhood growing up in backwoods Pennsylvania, and I’m thankful for the people and opportunities I had that made me successful and steered me away from several perhaps less fortunate alternative realities. Amateur radio was undoubtedly a positive influence, one that got me to where I am technically and professionally today. Dayton has overhead electric wires for trolleys. I can’t recall ever seeing this in my travels. I didn’t see any trolleys, however there were several city buses using the overhead electric wires. I wondered what it would take to equip an electric car with poles to attach to the electric lines and and get free energy for your vehicle (evil grin). Last year I promised myself that in 2015 I would spend less time on the flea market and more time on the floor and in forums. I was partially successful, attending one additional forum this year, the Clandestine Spy forum. This was a standing-room only presentation covering the equipment and techniques used by the Resistance during WWII. There were a lot of photographs. 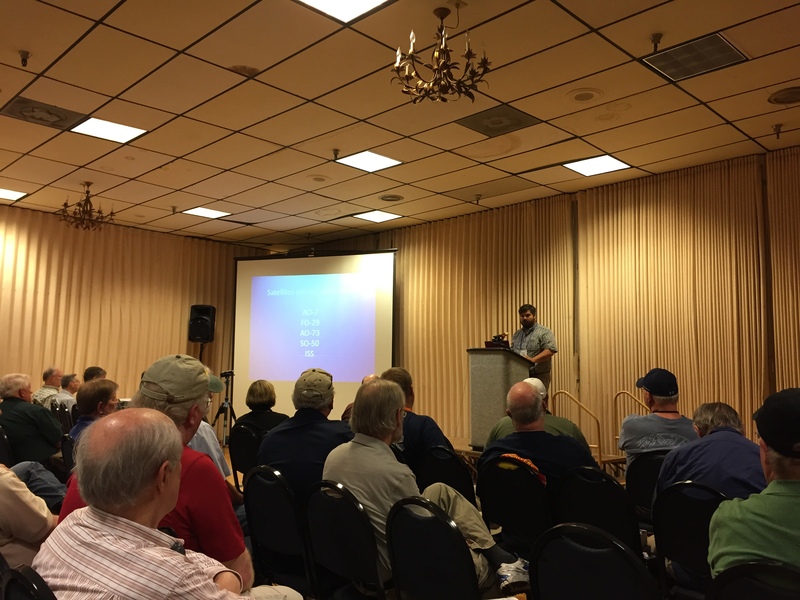 The AMSAT forum covered all the activities and projects the organization is working on, of which there are many. In the Fox 1 program there are four or five satellite projects in progress and at various phases. The big news was the potential for a geosynchronous payload, something satellite aficionados have been fantasizing about for decades. The amount of work that goes into these projects from an engineering, fundraising, political, and project management perspective is mind-boggling. It can’t be understated how complex this is. It is indeed rocket science. The expertise and human resources behind all this is impressive, and I can’t imagine the amount of time AMSAT volunteers and officers spend on this, as most undoubtedly have day jobs in engineering, technology, and science fields. 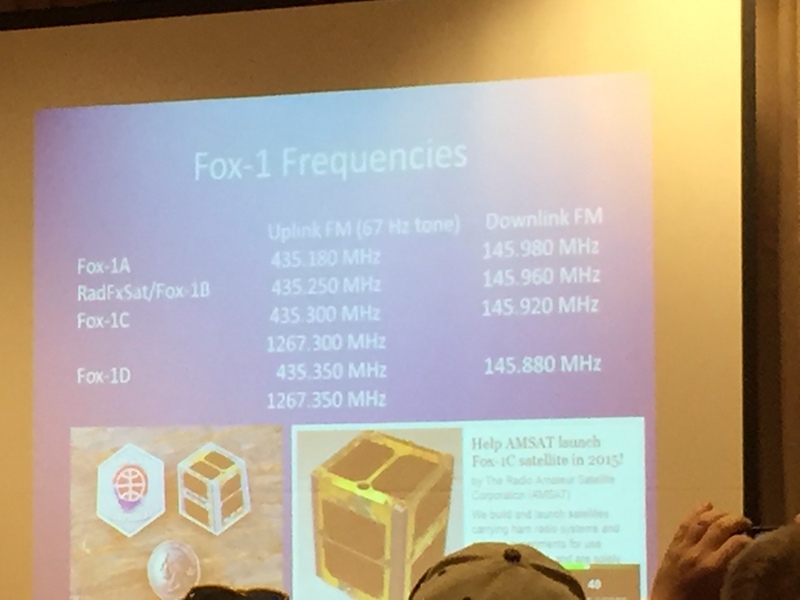 One speaker in the AMSAT forum presentation touched upon something that really struck a cord with me and others. Kids often see amateur radio operators as just operators. What really sparks interest in kids are experimenters and experimentation. What AMSAT is doing is experimentation, and at an extreme level. Space is interesting to kids, but it’s difficult to be hands on with it due to the very nature of it, and these satellites and the projects AMSAT is leading gives them access to this. AMSAT goes beyond providing flying repeaters for amateurs, but also partners extensively with universities, government agencies, and K-12 schools. This is not meant to belittle other activities within amateur radio, but I don’t think most people realize just how complex and far-reaching the activities of AMSAT-NA and other AMSAT organizations around the world are, and the benefit this offers to amateur radio today and into the future. While ragchewing, contesting, and DXing are traditional staple activities within amateur radio, the work of AMSAT has real world impact, and this is a vehicle for getting new people into amateur radio, ones that will likely stick around for the long haul. Case in point, sitting behind me during the presentation were two young guys, both from Virginia Tech and recently licensed. They are involved in an AMSAT project writing software for one of the birds. In talking with them it was clear they were very intelligent and they had a passion for what they were doing. Undoubtedly they will get high-paying engineering jobs upon graduating. Will they ever pick up a microphone or CW key? Maybe not, but satellite work has them hooked and it looks great on a resume. As one AMSAT speaker half jokingly quipped, there is no free launch. All of this costs money, and a lot of it. AMSAT is continually seeking donations and new members. With my annual membership running out, I decided to take the plunge and sign up for a lifetime membership. The Ballonsat forum was quite interesting and was well attended with a good number of movers and shakers who frequently launch, track, and recover balloons and payloads. A new area covered was pico balloons which are smaller balloons with extremely lightweight and small payloads. Several people have been launching these around the world with great success, some traversing the globe five to ten times. Friday night I attended the DX Dinner and got to network with movers and shakers in the DX world. It was worth the cost of the meal as I won a Comet antenna analyzer door prize. Not surprisingly, K1N was announced as the the DXpedition of the year. 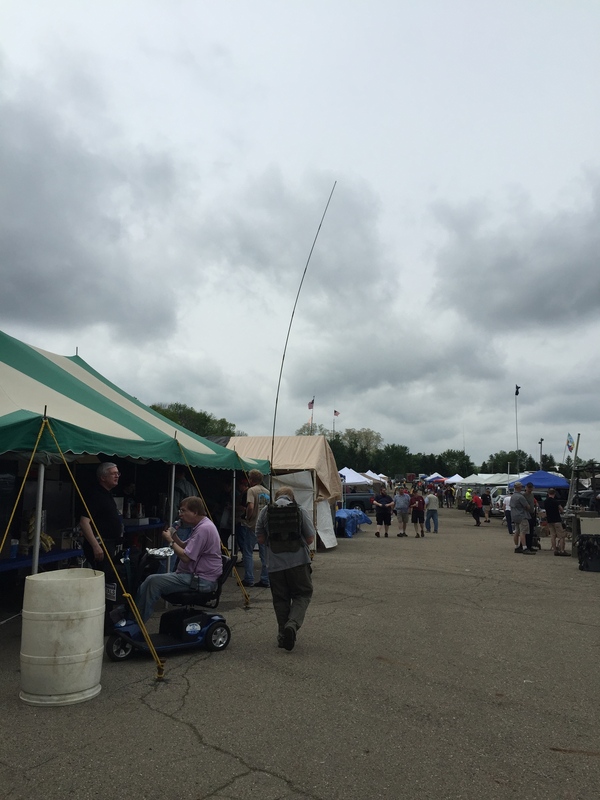 While I lamented about about flea market Neanderthals in the first part of this article, there were positive social aspects to the Hamvention. One morning walking in the crosswalk across the road going into Hara I observed an attendee thanking a black police officer stationed in the street for his service as a police officer. At lunch I could strike up a friendly conversation with anyone, total strangers. Folks stopped me to take a picture of my Morse code key tee shirt, many commented and laughed about it. There continues to be a sense of camaraderie in amateur radio. For this I’m thankful. 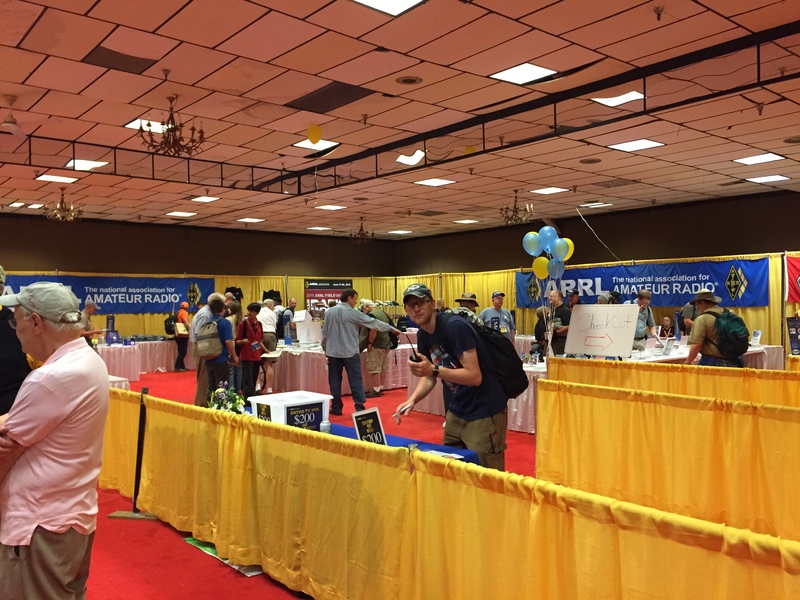 The ARRL area was superb. ARRL folks should be commended on the layout and organization of their area. They have all the bases covered and all booths within the area were well staffed. I brought a stack of QSL cards in for DXCC checking. The staff there did a great job of helping me out, after figuring out I initially screwed up my paperwork. I’ll continue to say it, but despite ARRL’s flaws and our disagreements, we are truly lucky to have such a hardworking organization within amateur radio. This article was originally published on the Radio Artisan blog. 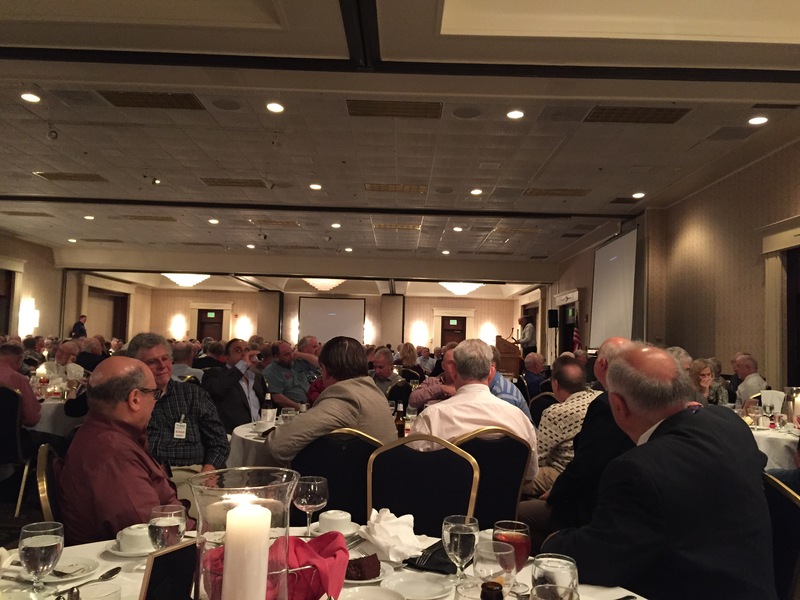 ‹ PreviousDayton 2015 – Part 1 of ?